Have Knockout Roses? Then Here’s a Disease You Should Know. 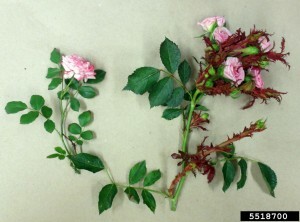 Rose infected with rose rosette disease on the right. Compare to normal rose on left. Knockout roses are one of the most popular plants in area landscapes. Released in 2000, it is known for its profuse blooms and carefree habit. A relatively new disease called rose rosette may be changing that though. Rose rosette is a fatal disease caused by a virus. It only affects roses. It was once fairly rare, but recently, we’ve begun seeing a lot more of it. This could be due to the widespread planting of roses in landscapes. The vector of this disease is an eriophyid mite, a microscopic mite that is extremely difficult to control in the landscape. This mite is so tiny it can feed inside flower and leaf buds where pesticides can’t reach. It transmits the disease by feeding on infected roses and then feeding on healthy plants. It is believed that any type of rose can be affected by rose rosette. Multiflora rose, which is considered invasive in North Carolina, can be a host of the disease in the wild. It can take several days for a bush to express symptoms after it becomes infected. Excessive thorniness. Rose canes may have a profusion of thorns that may or may not be hard. Soft canes. Rose canes may not be stiff but instead can be bent nearly in two without breaking. Witches’ broom. A witches’ broom is a bunch of growth in one area of the plant. Several buds will break in a short section of a stem, resulting in what looks like a broom. Some of these symptoms can also be caused by herbicide damage. For example, applying glyphosate (the active ingredient in Round-Up) too close to rose bushes can result in excessive thorniness, red, strappy leaves, and witches’ brooms. However, plants will grow out of herbicide damage, whereas a plant with rose rosette will continue to show these symptoms. As with any viral disease, there is no chemical treatment for rose rosette. Because it eventually kills infected plants, it is recommended that any bushes displaying symptoms be removed from the landscape completely. Removal should be done promptly after symptoms are noticed, and the bed can be replanted immediately. Just like in the stock market, diversification reduces risk. That is, if you plant only roses, and they get rose rosette, you’ll need to replant the entire bed. Whereas if you plant only three roses amidst other shrubs and the roses get rose rosette, you only need to replace three bushes. If you need help diagnosing plant problems or have questions about your garden, contact the Caldwell County Extension Service office at 828-757-1290.